Gregory "Greg" Keith Monroe Jr. (born June 4, 1990) is an American professional basketball player for the Milwaukee Bucks of the National Basketball Association (NBA). In his freshman season at Georgetown University, Monroe was named Big East Rookie of the Year. He was drafted by the Detroit Pistons in the 2010 NBA draft with the seventh overall pick and became the last Pistons player to wear the #10 jersey, after the Pistons retired the number for Dennis Rodman at halftime of a game against the Chicago Bulls on April 1, 2011. Monroe attended Helen Cox High School in Harvey, Louisiana. As a senior in 2007–08, he was named a McDonald's All-American and earned Parade All-America first team honors after averaging 21.0 points and 14.0 rebounds per game. Considered a five-star recruit by Rivals.com, Monroe was listed as the No. 1 power forward and the No. 8 player in the nation in 2008. In his freshman season at Georgetown, Monroe was named the Big East Rookie of the Year and earned Big East All-Rookie team and CBSSports.com NCAA Freshman All-American first team honors. In 31 games, he averaged 12.7 points, 6.5 rebounds, 2.5 assists, 1.8 steals and 1.5 blocks in 30.9 minutes per game. In his sophomore season, Monroe was named to the All-Big East first team, Big East All-Tournament team, USBWA All-District II team, NABC Division I All-District 5 first team, AP NCAA All-America third team and NABC Division I All-America third team. In 34 games, he averaged 16.1 points, 9.6 rebounds, 3.8 assists, 1.2 steals and 1.5 blocks in 34.2 minutes per game. On April 17, 2010, Monroe declared for the NBA draft, foregoing his final two years of college eligibility. Monroe was selected with the 7th overall pick in the 2010 NBA draft by the Detroit Pistons. On July 6, 2010, he signed with the Pistons. Monroe made his NBA regular season debut on October 30, 2010 against the Chicago Bulls. He came off the bench to score 2 points and 3 rebounds in 7 minutes. After coming off the bench for the first month of the season, Monroe made his first career start on December 10, 2010 against the Minnesota Timberwolves. In this game, Monroe recorded eight points, fifteen rebounds and a block in 35 minutes of action. Despite a slow start to the season, Monroe's production increased in 2011 as he became a solid scorer and rebounder for the rebuilding Pistons. On February 23, 2011, against the Indiana Pacers, Monroe had his best game of the season with 27 points and 12 rebounds on 11–17 shooting. On May 4, 2011, Monroe placed sixth in NBA Rookie of the Year voting totals, finishing closely behind Gary Neal of San Antonio. During the 2011–12 season, Monroe played in and started all of Detroit's 66 games. On February 8, 2012, he was selected to play in the NBA All-Star Weekend Rising Stars Challenge. Monroe and teammate Brandon Knight were both selected for Team Shaq, despite them being drafted in different years. During the 2013–14 season, Monroe recorded his third consecutive season with 1,000-plus points and 600-plus rebounds, joining Grant Hill as the only Pistons to do so since 1994–95. On June 30, 2014, the Pistons tendered a one-year qualifying offer to make Monroe a restricted free agent. On September 8, 2014, it was announced Monroe signed the Pistons' qualifying offer, thus making him an unrestricted free agent in 2015. The next day, the NBA suspended Monroe without pay for the first two games of the 2014–15 season for driving while visibly impaired in February 2014. On December 3, 2014, he scored a season-high 29 points in a 102–109 overtime loss to the Boston Celtics. On April 8, 2015, he returned to action after missing 11 games with a knee injury to record 19 points and 10 rebounds in another loss to the Celtics. On July 9, 2015, Monroe signed a three-year, $50 million contract with the Milwaukee Bucks. He made his debut for the Bucks in the team's season opener against the New York Knicks on October 28, recording 22 points and 14 rebounds in a 122–97 loss. Between February 9 and March 7, 2016, Monroe had a 12-game bench stint as head coach Jason Kidd tinkered with his line-up. In his first game coming off the bench, he recorded a season-high 29 points and 12 rebounds in a 112–111 win over the Boston Celtics. Monroe returned to the starting line-up on March 9 for the Bucks' game against the Miami Heat. In the Bucks' season opener on October 26, 2016, Monroe recorded 14 points and 10 rebounds off the bench in a 107–96 loss to the Charlotte Hornets. ↑ "Detroit Pistons To Retire Dennis Rodman's #10 Jersey". NBA.com. February 11, 2011. Retrieved August 13, 2014. 1 2 "Greg Monroe Bio". guhoyas.com. Retrieved August 13, 2014. ↑ "Greg Monroe Stats". Sports-Reference.com. Retrieved August 13, 2014. ↑ Clarke, Liz (April 17, 2010). "Greg Monroe declares for NBA draft, leaves Georgetown after two seasons". WashingtonPost.com. Retrieved August 13, 2014. 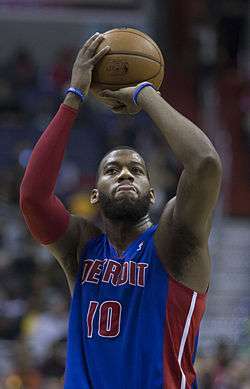 ↑ "Pistons sign rookie Greg Monroe". InsideHoops.com. July 6, 2010. Retrieved August 13, 2014. ↑ "Blake Griffin named 2010-11 T-Mobile Rookie of the Year". NBA.com. May 4, 2011. Retrieved August 13, 2014. ↑ "Greg Monroe Signs Qualifying Offer". CBS.com. September 8, 2014. Retrieved September 8, 2014. ↑ Goodwill, Vincent (June 30, 2014). "Stuckey's stay with Pistons appears over; team declines option on Billups". DetroitNews.com. Retrieved August 13, 2014. ↑ "Greg Monroe Signs Qualifying Offer". NBA.com. September 8, 2014. Retrieved September 8, 2014. ↑ Fenech, Anthony (September 9, 2014). "Detroit Pistons' Greg Monroe suspended two games for February DUI". Freep.com. Retrieved September 9, 2014. ↑ "BUCKS SIGN GREG MONROE". NBA.com. July 9, 2015. Retrieved July 11, 2015. ↑ Ohm Yougmisuk (2015-07-02). "Greg Monroe chooses maximum deal with Bucks". espn.go.com. Retrieved 2015-07-02. ↑ "Williams scores 24, Knicks beat Bucks 122-97 in opener". NBA.com. October 28, 2015. Retrieved October 28, 2015. ↑ "Middleton's free throw lifts Bucks over Celtics 112-111". NBA.com. February 9, 2016. Retrieved March 10, 2016. ↑ "Antetokounmpo scores 24 points, Bucks beat Heat 114-108". NBA.com. March 9, 2016. Retrieved March 10, 2016. ↑ "Kidd-Gilchrist, Hibbert help Hornets beat Bucks 107-96". ESPN.com. October 26, 2016. Retrieved October 27, 2016. Wikimedia Commons has media related to Greg Monroe.